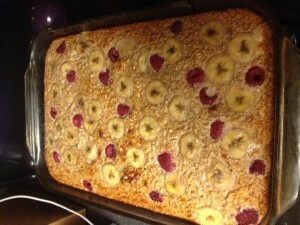 Here is a great healthy alternative to banana bread. You could do various modifications to this recipe with different fruits (raspberries, blueberries, blackberries, peaches, apples, etc). This is a very family-friendly recipe and my two-year-old had fun helping me slice the bananas with a butter knife and mix the ingredients together. 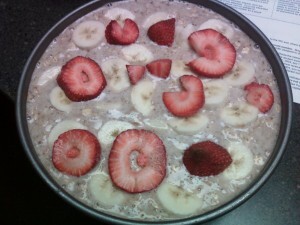 Because of the banana in it, this recipe is a little higher in carbs and sugar than my typical meals. 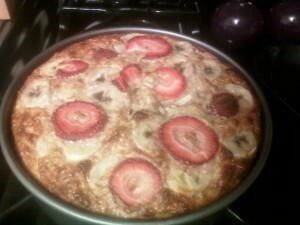 If you are really trying to watch your carbs and sugar you can make this recipe without the banana. 1. In a medium bowl, mix together dry ingredients. 2. In another medium bowl, mix together wet ingredients except for the fruit. 3. Spray an 8” or 8.5” round baking pan with non-stick baking spray (you could also use an 8×8 glass pan if you wanted). 4. 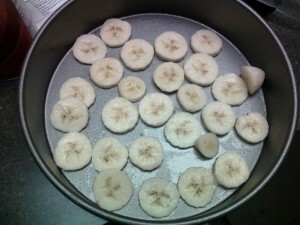 Line the bottom of the round baking pan with one of the thinly sliced bananas. 5. Mix the dry ingredients into wet ingredients — make sure it is distributed evenly. 6. Pour mixture on top of the layer of sliced bananas. 7. 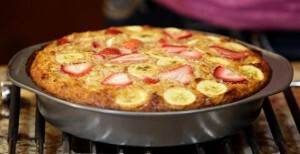 Cover with remaining sliced banana and sliced strawberries. 8. Cook at 375 degrees for 40-45 minutes until top is golden brown and knife comes out clean when placed through the center. This makes 4 servings (cut into 4 wedges). Small amounts of Greek yogurt, applesauce, stevia, spices, etc. This is a great recipe to make for a quick breakfast or a snack throughout the day. If you make this recipe, let me know what you think! It is easy and you can make it your own by adding different fruit. Could you leave out the protein powde? Would I need to add something in place of the protein powder? Thanks! Have you made it without protein powder? Want to make it vegan. Any suggestions as substitutes for eggs?